The diagram below outlines the general flow when using a Stock Take Device. 1.1b Key in Location 1 as Location1, Location 2 as Location2, Location 3 as Location3. Click on OK.
2b Select Microsoft Excel File(.xls), click on Next. 2e On the Fields Mapping screen as shown below, check the mapping (eg. 'Stock Code' is mapped to 'Stock Code' and etc). Once satisfied, click on Import. 2f A message box will pop up to inform you how many records are imported. 2.1 Download the item data from Mobile POS Software into the Mobile Stock Take Device. 2.1b At the Mobile POS Software. You can either click on menu Device -> Download to Terminal or click on the "Download" button. Click on Ok.
2.1c You will be informed once the download is done. 3.1. You are now ready to perform the stock take. To perform stock take using the device. Select "Stock Take" on the device. 3.2. Press "1" to select the first location. 4.1 Point the Stock Device Device at the Bar Code of the Stock Item to count and press the "yellow" scan button to scan the Bar Code. 4.2 Key in the quantity of the Stock Item. 5. You may check the data. 8a Kindly ensure that you use a new StockCountExportData.xls file. 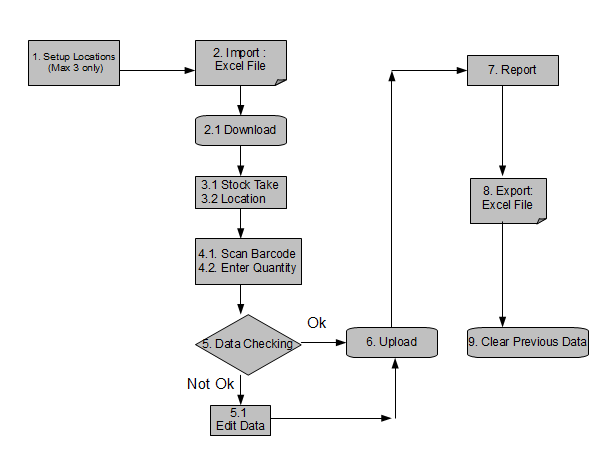 8b When you are ready go to menu File -> Export -> Stock Take Data. 8d At the Data Link Properties, click on Connection. -> select "Use data source name" -> select "stockcountexportdata". 8f At the Fields Mapping screen. Make sure the fields are mapped as shown below. Then click on Export. 8g After you perform the file export, rename the exported file with the name format of StockCountExportData_<Location>_<yyyymmdd.xls> (For Example: StockCountExportData_NewYork_20110211.xls).